This article uses different sources of United States data to focus on the retirement resources of women aged 55–64 in 2004, 1994, and 1984. Notable changes have occurred with women's pathways into retirement resulting from increased education and lifetime work experience. There appear marked cohort differences in potential retirement outcomes. 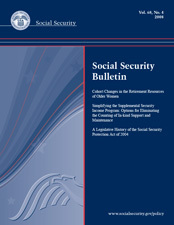 The Supplemental Security Income (SSI) program's policies for both living arrangements and in-kind support and maintenance (ISM) are intended to direct program benefits toward persons with the least income and support, but they are considered cumbersome to administer and, in some cases, poorly targeted. Benefit restructuring would simplify the SSI program by replacing ISM-related benefit reductions with benefit reductions for recipients living with another adult. This article presents a microsimulation analysis of two benefit restructuring options, showing that the distributional outcomes under both options are inconsistent with a basic rationale of the SSI program.